BOUWER, Argentina , Dec 16 2013 (IPS) - Towns traditionally celebrate their most characteristic aspect. 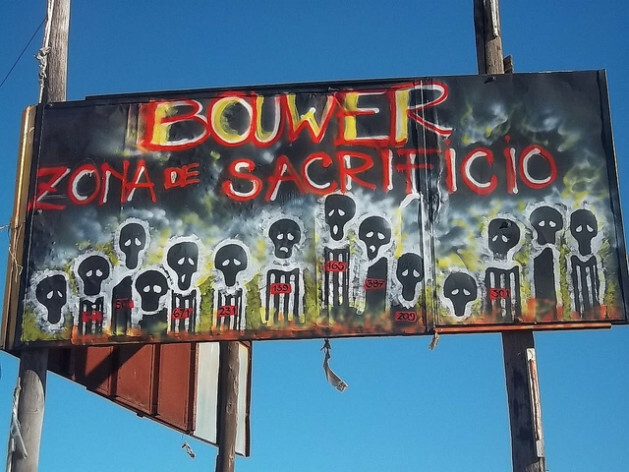 So the town of Bouwer in central Argentina decided to “celebrate” garbage. But the “first provincial festival of pollution and against discrimination” is not a reason for pride, but a mechanism of resistance by a town that wants to stop being “an area of environmental sacrifice” in the central province of Córdoba. In the festival, to be held Feb. 22 in this working-class town of 2,000 inhabitants located 17 km south of the provincial capital, Córdoba, “there will be ‘asado con cuero’ [beef barbecued in its hide over an open fire, a traditional meal] and different artists,” the signs say. For 28 years, Bouwer was known as the site of a garbage dump that accumulated, in nine different landfills without protective membranes – 12 million tons of waste from the capital and surrounding municipalities. After years of struggle by local residents, the dump was closed in 2010. But no clean-up was carried out to reduce the environmental and health impacts, as the townspeople and local government of Bouwer are demanding. “Besides affecting our quality of life, the dump is still polluting the water and the soil, from surface runoff, and the atmosphere, from the gases that are emitted,” the municipal environmental adviser, Adolfo González, tells Tierramérica. But the festival won’t only feature the dump, Nayla Azzinnari, the press secretary for the Bouwer Sin Basura (Garbage-Free Bouwer) movement, comments to Tierramérica. These include a vehicle pound, a hazardous waste incinerator (which is now closed), a lead smelter whose open smokestack created health problems for local residents between 1984 and 2005, a shipment of 12 tons of DDT and other dangerous pesticides that arrived in 2005 but were removed due to the protests by the locals, and a pit containing toxic industrial waste. And as if this weren’t enough, fields of genetically modified soy surrounding the town are constantly sprayed with toxic agrochemicals, like in the rest of the rural areas in Córdoba province. “It’s a cocktail of pollutants…we can’t accept any new sources,” says González. But there are new reasons for the festival. 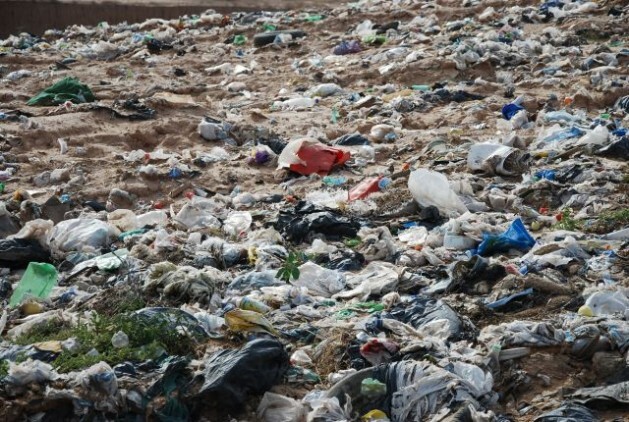 The Córdoba city and provincial governments plan to open a new dump 600 metres from the first, which will receive some 2,500 tons of waste a day from the city and adjacent municipalities. “It sounds like a joke: closing down one dump and opening another in the same place,” Mónica Rescala, another member of Bouwer Sin Basura, tells Tierramérica. In the Cornelio Saavedra rural school, which stands next to the old dump and around 1,000 metres from the site of the new one, schoolchildren, teachers and mothers like Rescala are watching a video explaining the risks posed by the landfill. “We were shocked by the stench and the number of pests in the school: flies, mosquitoes, huge rats. We couldn’t work in such an unhealthy environment,” the school principal, María Teresa Destéfanis, tells Tierramérica. The cruel irony is that the school has no garbage collection service. In October, Bouwer Mayor Juan Lupi declared a public health emergency. From 2000 to 2012, infant mortality in Bouwer stood at 22 deaths per 1,000 live births. That rate, obtained from the records of births and deaths in the civil registry, is nearly two times the provincial average of 11 deaths per 1,000 live births in 2010. The perinatal mortality rate (stillbirths or newborns who die in their first week of life) stood at 25 for every 1,000 – two and a half times the provincial rate. But no epidemiological studies have been carried out here, despite the fact that the numbers of cases of respiratory and skin ailments, cancer, miscarriages and premature births in Bouwer are also alarming. “We started to see malformations in animals, which became particularly noticeable around 2008: dogs with cleft lip and cleft palate, pigs that are born without hair and with their stomachs and testicles full of water, cats without claws, chickens without feet,” Rescala says. “Dumps mainly emit methane and carbon dioxide, but also nonmethane organic compounds, which include toxic, carcinogenic gases,” FUNAM says. “In these polluted landfills, which have no membrane, the volatile substances in the waste, many of which are toxic and carcinogenic, can be carried by the wind long distances. And the stench is nauseating,” the organisation adds. According to González, approval is about to be obtained for landfarming – a bioremediation treatment process used in the management and disposal of petroleum refinery waste products. The site would be installed two and a half km from Bouwer. The schoolchildren make drawings about the video they watched. “I don’t want there to be garbage here,” says 10-year-old Alan Serrano. The report that described the outskirts of Bouwer as “optimum” for the installation of a new dump was carried out by the National University of Córdoba, at the request of the city government of the provincial capital. The second part, on specific socioenvironmental aspects of the focal areas [which has involved work on the ground by teams] is in the final stages…the draft document is being corrected after being revised by the municipal government,” he says. But in the first part of the report, it becomes clear that Bouwer is a highly vulnerable part of the province. The unemployment and illiteracy rates are among the highest in the province, 63.3 percent of the population has no health coverage – the highest proportion among the areas studied – and nearly 24 percent of local residents have unmet basic needs. While academics and government technicians analyse the report, and quietly argue that “the garbage has to be dumped somewhere,” the local residents of Bouwer know that there are other solutions. “Everyone should become aware and start to recycle,” says Rescala, who recycles nearly 100 percent of her trash, even though she is surrounded by dumps. “We know that no place can be sacrificed. This time it’s Bouwer, but it could be any town next,” she says.